Rafi Ahmed, director of the Emory Vaccine Center, will present the Distinguished Faculty Lecture, titled "It's All About a Mouse Virus," on Tuesday, Feb. 7. World-renowned immunologist Rafi Ahmed, a professor in the department of microbiology and immunology at the Emory University School of Medicine and director of the internationally recognized Emory Vaccine Center, will give the 22nd annual Distinguished Faculty Lecture. His lecture, entitled “It’s All About a Mouse Virus,” will be presented Tuesday, Feb. 7, from 4-6 p.m. in the Winship Ballroom of the Dobbs University Center. A reception will follow. Hosted by the Faculty Council, the presentation is traditionally part of Founder's Week, which commemorates the first meeting of the Board of Trustees on Feb. 6, 1837, following the founding of Emory College. The Faculty Council Distinguished Faculty Lecture Committee, comprised of past distinguished faculty lecturers, nominates the speaker for approval by Emory's president and provost. A member of the National Academy of Science, Ahmed is noted for his work addressing the fundamental question of immune memory — the basis of vaccination — that has helped to shape scientific understanding of memory T cell differentiation and anti-viral T and B cell immunity. T cells are a type of white blood cell able to recognize and destroy invading pathogens, such as viruses. In studying the longevity of T-cell memory, Ahmed has examined how our bodies attain and maintain immunological memory, regardless of the virus involved. His work has helped provide a roadmap of how T-cells function and how this functioning might be improved. His laboratory uses highly sophisticated cellular and molecular techniques to study antigen-specific immunological memory in marine, primate and human systems. Another focus of his work is to develop strategies to restore viral function in virus-specific T cells during a chronic viral infection, such as HIV or Varicella-zoster virus. 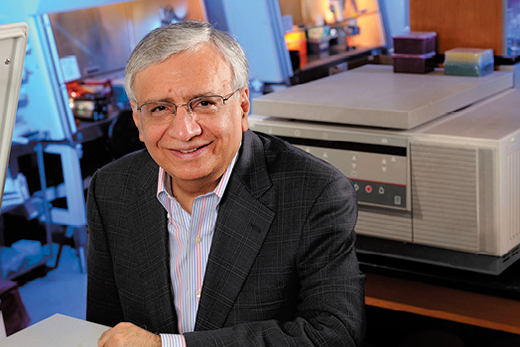 An Eminent Scholar with the Georgia Research Alliance, Ahmed also serves as an investigator with the Emory Center for AIDS Research. He is also a member of the Discovery and Developmental Therapeutics research program at Emory’s Winship Cancer Institute. The long-term goal of his research is to understand the mechanisms of B and T cell immunological memory and to use the information to develop new vaccines for the prevention and treatment of disease. His studies have given rise to the possible development of a universal influenza vaccine in the near future. Under Ahmed’s leadership, the Emory Vaccine Center is now among the world’s largest and most comprehensive academic vaccine research centers, with more than 30 faculty members, a research staff of nearly 250 and laboratories in New Delhi and Atlanta. Originally known for extraordinary contributions related to the development of vaccines for HIV/AIDS, the Emory Vaccine Center is now recognized for its work with vaccines against hepatitis, malaria, tuberculosis and influenza. Recent research efforts have addressed rejuvenating the exhausted immune response to chronic viral infections and cancer. While at Emory, Ahmed received the 2014 Emory 1% Award, which recognizes Emory faculty whose National Institutes of Health (NIH) proposals have been ranked in the top one percent by NIH reviewers. In 2016, he was named to the MilliPub Club, which recognizes Emory faculty who have published one or more individual papers throughout their careers that have each garnered more than 1,000 citations.